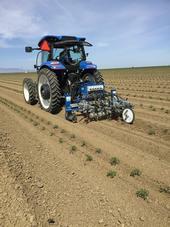 We ran the robovator in twin row processing tomato yesterday in the Westside of the San Joaquin Valley (see photo). We conducted intra-row cultivation at up to 5 mph without damage to tomato. With high labor costs and only a trickle of new herbicides we need to take this technology very seriously because it has great potential in California vegetable crops and probably many others like cut flowers.